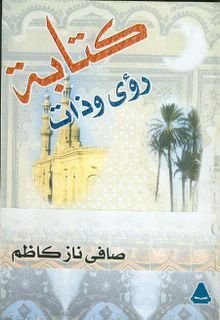 This lovely book was my companion on a recent Alexandria-Cairo train ride. I found it tucked away on a shelf in the cavernous, dusty GEBO bookstore on Sa'd Zaghlul Street, for an incredible LE6.50 and took it for the ride. As the bucolic Delta scenery whizzed by under a gentle afternoon sun, I was lost in the magical world of Safinaz Kazem, one of our most entrancing and stimulating writers. In person, Kazem is a famously curmudgeonly presence, quick to exasperation, but not without humour. Anyone who's seen Tahani Rached's wonderful "Four Women of Egypt" remembers Ustaza Safinaz as by far the most lively and opinionated of the lot; I'll never forget her hilarious dream about Gamal Abdel Nasser, and her whimsical bedroom furnishings. In writing, Ustaza Safinaz is a lyrical, irrepressible, utterly engaging voice. I laughed out loud many times, at her seamless twining of the mundane and profound, the literary and the quotidian, the beautiful, bad, and the ugly. She's one of a handful of cultural critics who actually write criticism, as opposed to tedious, inept summaries of texts. For this alone this collection is a worthwhile treat. But there's much more. Writing: Visions and Self is a wide-ranging series of essays reflecting the range of Kazem's interests: essays on artists coexist with heartfelt tributes, tender reminiscences about her ever-vivid childhood, reflections on what she calls "writing as affliction", cutting remarks about revered figures (her send-up of Ghada al-Samman is priceless), and superb narratives of her colorful life: brief marriage to the poet Ahmad Fuad Nigm, giving birth to her only daughter Nawarat al-Intisar in October 1973, and her long and productive life as a creative writer in the state-owned press since age 18, working with Ahmad Bahaeddine, Mustafa Amin, Makram Muhammad Ahmed, and the hateful and hated Yusuf al-Seba'i. Every word, every comma, every image in Kazem's writing is agonized over and painstakingly chosen. This is a writer who's gifted--and afflicted--with the power of saying what she means. I read the 316-page book and found not one extraneous sentence. How rare is this in modern Arabic writing, when acres of precious print are wasted on saying nothing at all? Like George Orwell, Kazem never reaches for the stale, commonplace image or turn of phrase; there's a wonderful freshness that graces her prose. Kazem's words on Salwa Bakr apply equally well if not more to her own writing: "The first trait in Salwa Bakr's fiction is that it lures you into reading and pulls you to engage with the pages. This has become a rare trait. And so it bears mentioning whenever the days smile upon us and we encounter it in a piece of writing," (p. 199). "Every morning we met in the garage of Akhbar al-Yom with Rawiya Attiya leading the consciousness-raising caravan. We got into the newspaper's cars and drove around under the June sun, from morning to late afternoon, going into factories and hospitals and traveling to villages and hamlets. Rawiya was energetic and enthusiastic, neither fatigue nor boredom catching up with her from the speaking and repeated explaining here and here and there. She would hold up the voting card for electing Gamal Abdel Nasser, with his picture and two circles under it: "yes" and "no". Consciousness-raising consisted of steering opinion to the "yes" circle, a foregone conclusion...At that time, Gamal Abdel Nasser was the undisputed, beloved popular leader, upon whom all hopes and dreams were pinned. Rawiya Attiya's love for him was sincere, and our love for him--at that time--was also sincere. "Patriotism" in the minds of the female masses, whom we were urging to exercise their right to vote, meant electing Gamal Abdel Nasser," (pp. 48-9). From 1960-66, Kazem lived in New York and attended New York University, living in the bohemian Greenwich Village, a time she always recalls fondly as a formative period in her development as a writer. I'll never forget the hilarious bit in "Four Women of Egypt" when she describes her camping trip with her sister in the United States and their proud plugging of the achievements of Nasserist Egypt. "Well, do you have snow in Egypt?" they were asked. "We will after the High Dam is built!" Upon her return to Egypt, Kazem resumed her work as a journalist. In August 1972, she married Nigm, surely one of the most whimsical unions in Egyptian cultural life, and Kazem has an equally whimsical explanation for it. "Whenever someone tried to dissuade me from marrying him, my feeling of the necessity of expediting the marriage intensified. It wasn't a love story between him and I but a story that no one believes when I tell them; it was a poetic stance on my part that exceeded in its beauty coventional tales of love between men and women," (p. 22). Despite this amusing self-regarding gloss, Kazem is reflective rather than bitter when describing their break-up. She continued writing columns in various magazines, distinguishing herself as a theater critic. Since 1997, she's become a regular contributor to the monthly al-Hilal, where she's a consistently provocative, moody, and thought-provoking presence, her purview expanding beyond theater to take in all matters cultural (and sometimes political). There's plenty of what might conventionally be called nostalgia in Kazem's essay collection, and in fact it's one of the most endearing qualities of her writing. But somehow, she escapes the worst aspects of this genre; there's none of the condemnation of the present and idealization of the past that seem to define so much of nostalgic writing. And thank goodness she's not nostalgic about Wust al-Balad; I've had enough of the trendiness of downtown Cairo and its refined European ethos bla bla bla. Instead, Kazem constructs incredibly vivid portraits of her Abbasiyya childhood, and it's clear that her girlhood is still very much with her. Her current Abbasiyya residence is an attempt to recreate her beloved childhood apartment, she tells us. Also not to be missed are Kazem's accounts of her family's cordial but increasingly tense relations with their Jewish neighbors after the 1948 creation of Israel. Unlike Andre Aciman's memoir Out of Egypt or Radwa Ashour's novel Qit'a min Orobba, Kazem's account of Jewish Egyptian life is a rare child's-eye view unfiltered by political agendas or the insufferable romanticization of upper-class Jewish life that Aciman has turned into a lucrative career. Instead, Kazem narrates life with her Jewish neighbors as a child would, with hilarious and politically uncorrect candor. Safinaz and her sister carry on a graffiti war with their neighbor Sheila about Palestine's rightful owners ("Jews" covers "Arabs" and vice versa in an endless contest that Safinaz and her sister started) until Sheila's Rabbi grandfather comes up to talk to Safinaz's mother. The parents have a tearful chat in the parlor about their common identity as Arabs and the bonds between neighbors, each vowing to give their respective daughters a good beating; Safinaz and her sister eavesdrop nervously and quickly make themselves scarce when they hear their front door close behind the Rabbi and their mothers' determined steps approaching (pp. 79-80). After a wistful stroll through her childhood neighborhood with filmmaker Tahani Rached, Kazem writes, "We decided that the notion of a "beautiful bygone era" (al-zaman al-gamil) is largely illusory. The label "beautiful bygone era" has become attached to every past in politics, culture, fiction, art, and cinema. And even though as I have shown I yearn for many things I experienced in my childhood, glimpsed in a street, building, book, etc., I acknowledge that objectively I cannot elevate individual nostalgia and feed it to people as a supposedly collective nostalgia for an era that was not as beautiful as the nostalgia illusion makes it out to be," (p. 69). Is it just me, or is this level of self-awareness and self-critique nearly extinct in contemporary cultural life? Who else can write with sagacity and insight about figures as diverse as the American writer Ernest Hemingway, the Iraqi crooner Kadhim al-Sahir, retired judge Tariq al-Bishri, late feminist (and Kazem's grade-school teacher) Latifa al-Zayyat, the journalist Sana' al-Beesy, "the obsessions of film director Muhammad Khan", the Palestinian poet Murid al-Barghouti, the women's rights pioneer Nabawiyya Musa, nationalist leader Fathi Radwan, Czech writer Milan Kundera, and last but not least the famous radio personality "Baba Sharoo", Muhammad Mahmoud Sha'ban, whose radio programs shaped Kazem's generation and to whom the essay collection is warmly dedicated. I can think of no other contemporary writer with such versatility and eclectic interests. Also sprinkled throughout the essays is what can best be called "the poetry of everyday life", where Kazem spars with her cat "Vivian Leigh", nourishes her plants, washes the dishes to ward off writerly anxiety, and otherwise fills hers days with a poet's angst and insight. I didn't realize it when I picked up the book, but it is a beautifully wrought journey into recent Egyptian history. If you love history or want to know more, this is a fun place to start. Kazem has lived a long, examined, sentient life, and her uncanny memory illuminates so much of our recent past. Her life intersects in so many fascinating ways with other notable Egyptians, yet she's also very much an ordinary Egyptian woman with a child's sense of sprightly wonder and humor. In short, her ego is not an issue, and how many people can you say that about in public life?! Therein lies the power of her reminiscences and narratives. Perhaps it's necessary to deal with the elephant in the room: Kazem's turn to Islam and the higab. Frankly, this is her least interesting and least creative side as far as I'm concerned. When Kazem ventures to talk about politics, her interventions are stupid. When she feels compelled to give unsolicited lectures about Islam, she's defensive and shrill. I can't quite get my head around this aspect of her personality, but I suppose it's part and parcel of her general cantankerousness. As "Four Women of Egypt" showed so well, each of the women is a delightful and very Egyptian bundle of contradictions, and none more so than Kazem. Her Islamic "turn" is part of who she is, but it doesn't surface at all in this essay collection. And neither do her bizarre takes on politics, thankfully. Two of Kazem's pieces particularly resonated with me. On the occasion of her 60th birthday she writes, "Everything for me begins and ends with the self, and the terms "self" and "selfhood" for me are positive because, honestly, I have not had the honor of encountering "objectivity" in all my life....All my columns were corners from which I emerged from my self to talk about all aspects of life, art, theater, and issues of creed, nation, and humanity, responsible for myself, separate from the arenas of debate and give and take." Finally, Kazem's last essay is a truly transporting piece of writing, perhaps because I experienced an intense pang of recognition. "My restorative trip to Sharia al-Ghuriyya" (rahlaty al-ta'wideyya fi sharia al-Ghuriyya) is a walk I too have taken, along the long snake of street connecting al-Azhar street to al-Qal'a. "This place is the essence of Cairo." On a January day, from 11 in the morning to four in the afternoon, Kazem leisurely strolls up this artery, picking up plastic bags full of carrots, tangerines, and green beans along the way, and beautiful woolen shawls and Fayoumi kilims with "Proudly made in Egypt" emblazoned on them in English. As she reaches sharia al-Qal'a, "To my regret I awoke, and would that I hadn't, from my restorative five hour trip from the entrance of Ghuriyya, where I cleansed my heart and filled it with joy." I'm sure I'm not the only one who's had this same magical, cathartic feeling on this particular stretch of street, full of "cleanliness, kindness, mutual aid, and religion, as if the street is a long corridor in a family house." But I doubt that anyone else can write about it with such grace and wonderment. Empowering Women, Anywhere but the U.S.